Your gripes, tweets and comments about the December 2011/January 2012 issue. dispelling our preconceptions about who can be creative (“The Vision Thing”). others, how we engage the world–if embraced creatively–can be the real fuel for an economic renaissance, even if it isn’t front-page news. masterpiece? A great director will always have a number of duds, but that’s because a great director is always trying, always pushing. 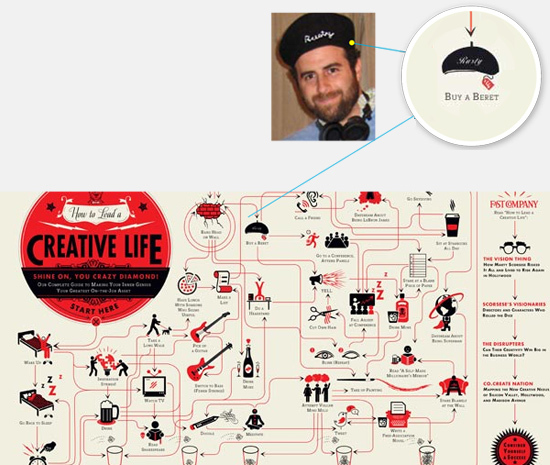 How to Lead a Creative Life [INFOGRAPHIC]:: LOL did @FastCompany follow me around one day? respect, so why can’t we seem to get serious about women? with it. Most men can’t handle the scrutiny. But pure talent and genius all are in the individual. If girls really were so smart, the first Steve Jobs would have been a girl. modern times, allow ourselves to say one group of human beings is superior based on their biology? of a kind? If you want to end sexism, end it. Period. red lipstick. For more information, visit the campaign at youare.cn.com.